I didn't get chance to add these pictures at the time and so I thought I would do it now. The first two pictures show my Florence mannequin in a room set for the Ideal Home Magazine Feb 2011 issue. It's great when I get to send off a mannequin for a photo shoot as I always look forward to seeing how she has been used and styled. This one was a romantic, French chic setting. I can't wait to see how my Austen mannequin has been used in the room sets of the Ideal Home Show. I'll remember to take my camera when I visit and take a few pictures. The pictures below were from the Jan 2011 issue of 25 Beautiful Homes. I'm always willing to send pictures for articles, or loan out mannequins for photo shoots, so do get in touch if there are any projects you need a mannequin for. I've just got back from the post office with some great new fabrics for my Retro Collection. I have chosen these four fabrics, which I think are bold and unique - just what I was looking for! This one is called 'Como' and is a stunning design of butterfly wings and peackock feathers. Can't wait to get started on this one! This one is called 'If She Sews She Knows'. 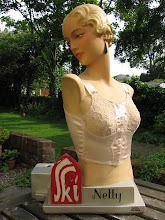 My 'Home Sewing is Easy' mannequin has been very popular and this one is a similar theme, so hopefully she'll be a hit too! Love this one - 'Peace'. Can't wait to see what she looks like made up. When I saw this one - 'Dressforms', I couldn't resist. 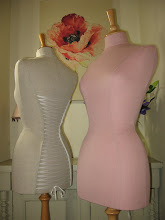 Well I do make mannequins, so how could I not buy a fabric covered in them! I'm in the middle of a few big orders at the moment, but as soon as they are completed I have decided to focus on the Retro Collection for a while. I have a pile of fablous fabric just waiting to be made up and I need to complete the mannequins in this collection. Oh to have more hours in the day! I love unpacking my new mannequin finds and discovering what kind of condition they are in. It was such a joy to pull back the bubble wrap of this lady and see her looking so lovely - I think she must have the best condition fabric for a mannequin of her age I have seen in a long time. She has a tiny 22 inch waist and such lovely tailoring. She is a French Stockman make and must have been used to tailor and display such wonderful gowns. The mannequin below is a French Stockman c1940s mannequin, again in great condition. It has been such a busy and fulfilling start to the year! There are lots of orders to be completed, as well as exciting ideas for the future and new fabrics to tailor with. I'm off to the Ideal Home Show in a few weeks to get lots of ideas and also to see one of my mannequins being used in one of the room sets! More about that soon.